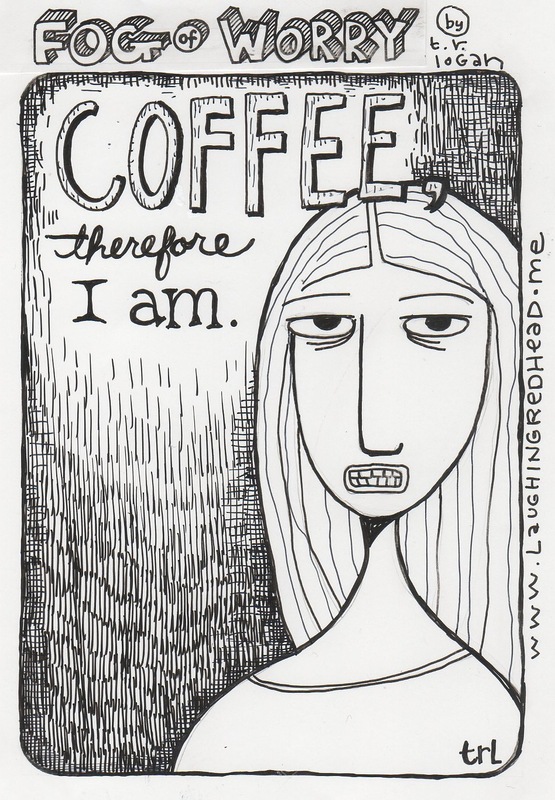 FOG OF WORRY: COFFEEeeeeee . . .
Late start today - needed mucho caffeine!!! Also, I'm getting ready for Frankenstorm Sandy . . .! Two things today: Autumn, and Fear of Birds. Fall is in the air, and I love it!! Not just because I'm an October baby. While we are waiting to see where this next hurricane lands (what a dang long hurricane season! ), it's so great to feel that cool chill edge in the air! I keep a file I call "Earthy," and in that file I keep nature colors and cutouts of trees, leaves, etc. I keep a sketchbook where I press leaves from my walks in Colorado and Virginia - so some of these go back years. I incorporated a lot of my aspen leaves from Denver into two large pieces I did for my church here in Toano. Okay, now to birds. They creep me out. Much in the same way clowns do. Man, if there was a clown with bird wings, that would be - brrrrrrr. Anyway, I'll have to make art about that, just to purge that visual from my punkin' haid. The bird piece here is from those little cardboard coffee cup thingies you get from Starbucks, which I taped together with clear mailing tape; I added grommets and used jewelry wires to secure it in the wirebound sketchbook I use as my current (large) art journal. Raphael's famous angel, and a REAL warning sign about birds help out the idea . . . yes, Hitchcock has had a big influence on my psyche . . . doh!! The mottled background here was from painting on bubble wrap, and using a brayer to rub down the pattern. I did this one layer at a time. Still art journaling during Irene and in the aftermath - using daylight and a tiny little book light to work with at night :-) I cannot scan right now, no power since last Saturday mid-day, so forgive the quality of some of the pics, which are taken with my iPhone and might not show the detail I usually like to! I'll upload scans when I can :-) Happy journaling, all, and I want to remind you who live in the Hampton Roads area (provided you can read this, since 100s of 1000s are still w/o power! ), to take care, the trees are still falling!! AND, that I will be teaching MULTI-MEDIA ART JOURNALING at the Williamsburg Art Education Center in September, starting the 15th. Just click on the link to the right, to sign up! I confess - I like prissy coffee. By that I mean, enhanced coffee. Where you add a lotta milk, or some multi-syllabic syrup flavor. I think this started when I was a kid, at my grandma's house, having fried chicken for breakfast, and she would make us coffee-milk. Which was basically, coffee for the kids, mostly milk (this could have been to camouflage that fresh, very rich cow-milk, which wasn't my fav - I wanted "real milk!" My grandmama had no idea she was training me for Sbux!! Yep, I love me some grande sugar-free hazelnut soy lattés. *sigh* Salivating as I write this. Speaking of which, one day I was at Sbux, and this guy ordered a (and I quote! because I WROTE IT DOWN!) - he ordered an "iced-grande-breve-four-cups-of-ice-white-mocha." And I remember thinking, I don't wanna know THAT guy. He R high maintenance incarnate. I'm working on creating pages from trash - so here's the first one I think I've published. You can tell how this page was made - with discarded cardboard-thingies (what ARE those things called?) which I taped together with clear packing tape. I added paper flowers and sewed them on with beads. I added grommets to the ends and used jewelry wire/hooks to add them to my spiral sketchbook. I still have not mastered the little grommet thingy, though. The shape of this page is as you see it, just defined by the shape of the handholder-cardboard-thingies; the page you see peeking from behind it is part of a sheet of papyrus - working on an Egyptian page for later. Today we are getting air quality warnings due to the Great Dismal Swamp fires in North Carolina. We are getting ready for Hurricane Irene and recouping from the shock of a 5.8 earthquake yesterday. Who knew Virginia had all THAT goin' on? And you thought it was all tricorn hats, peanuts, and ham.